On a day where the world witnessed the Supermoon, the Punekars witnessed a lacklustre game bereft of quality and pace, between FC Pune City and Chennaiyin FC in the Indian Super League. The surprising exclusion from the lineup was the in-form defensive midfielder Rohit Kumar, who was out due to illness. The exclusion might have proved to be costly for the home side, whereas Chennayin FC boasted of an Indian contingent that had Indian national team regulars and ended up getting the three points, maintaining their winning run at Balewadi Stadium. Although the South Americans ran the show for both the teams. The Indians did have some impact in the match. Here are the player ratings of the Indian players that were part of the encounter. The U-23 international and former Shillong Lajong keeper did not have to do much in the first half, but a fine save in the 34th minute denied Chennai the lead. His poor decision-making could have cost the home side a goal had it not been for Rafael Gomez’s goal-line clearance. There are arguments whether he could have done better as far as conceding the goal was concerned, but nevertheless he had a decent display. Had a crucial role in the game and had a big impact on the match. This was the third match in a row where he has played the dark-horse of Pune. He could have done better as far as defending the crucial corner was concerned, but the dark-horse kept doing his job during the course of the match. He had a hair-do resembling Sandesh Jhingan and even played like the Kerala Blasters captain. Think of it as what if Jhingan started playing as a defensive midfielder. 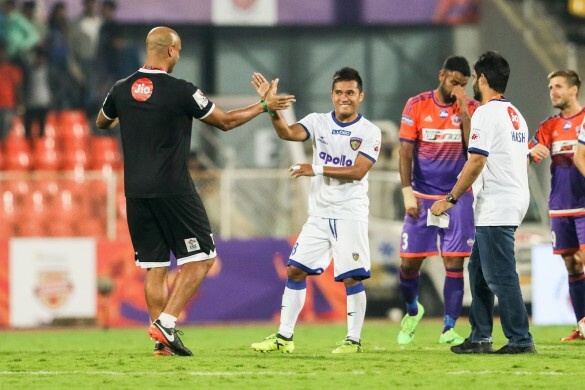 There was an unnecessary miscommunication with Diego Carlos that resulted in a Chennai corner. An interception in the middle and a crisp pass led to a Marcelinho shot that whizzed past the first post. He had a rough start to the second half and was in the referee’s book as a result. Pune, meet your new “head: master. Almost all clearances and interceptions were done using his head, literally. Improved defending and clearing of the ball whenever needed. Avoided unnecessary gameplay. Provided some good long passes to the Pune forwards. A very improved display indeed. After excessive usage of his head, he needed some medical assistance to get rid of the aches. But after the doctors let him go again, the original Baljit returned. Fanai was quiet for the first 15-20 minutes, but then his link-up play with Marcos Tebar came into light. His coordination with the Spaniard was absolutely spot on. One-two and first-touch passing was crisp and his sprints were timed perfectly. He kept on attacking through the left flank and was eventually substituted by Jonathan Lucca. Isaac was a beast on the wings and with the crosses. But, only after 30 minutes did he start wreaking havoc on the left flank. Long passes from Sahni, Tebar and Adil Khan found him and created some goalscoring opportunities through crosses that didn't eventually find the perfect target. He dribbled through five Chennai players on his first opportunity on the ball. Blistering pace along with confidence right from the first minute of his appearance looks like a start is approaching soon for the Mumbai winger. Came on for Khan in the final stages of the game and made a crucial block to deny Anirudh Thapa a chance to double his team’s lead. Kept Chennai in the game with a fine save in the first half from a crisp Marcelinho free-kick. Add to that, the former Chennai City keeper made a pinpoint fabulous reflex save to deny Emiliano Alfaro from getting the lead for Pune. The goal was ultimately called offside, but the save was incredible. He had told Khel Now on the ISL Media Day that his decision-making is his ultimate quality and he proved that in this match. He took some time to settle into the game and got involved in nasty collisions in the first half and continued to struggle during the entire half. The national team forward did what he does best, putting the opposition defenders under constant pressure. His never-ending stamina always kept the Pune backline on their toes, but did not create any goalscoring opportunities. In short, he was not the original Jeje we know. Gurtej Singh kept him quiet throughout the entire first half and he did not make any significant impact in the second half either. Missed the near post with a header, had superb positional sense and got into space to receive the ball in the defensive as well as attacking third. However, his passing and interception skills could have been better in the first half and passing accuracy was not great either. His efforts earned him the Emerging Player of the Match award. He had one tough job to do. Marking and keeping track of Marcelinho and Diego Carlos. Both kept charging through his flank throughout the first half, but the young Indian justified why he deserves a place in Stephen Constantine’s lineup. A fantastic curling ball from the corner earned him the assist in the game. He deserved the Hero of the Match award though. Came on for Bikramjit Singh in the second half, and was booked within three minutes of his arrival. He had a shot at goal, but it was deflected due to a brilliant block from Golui.